Souřadnice: 51°23′54″ s. š., 0°5′8″ z. d.
51°23′54″ s. š., 0°5′8″ z. d.
Crystal Palace FC (celým názvem: Crystal Palace Football Club) je anglický fotbalový klub, který sídlí v jihovýchodním Londýně. Založen byl v roce 1905 jako pokračovatel tradic původního Crystal Palace, který zanikl v roce 1876. Stejně jako původní klub byl i tento pojmenován podle slavné londýnské budovy stejného jména. Od sezóny 2013/14 hraje v Premier League (nejvyšší soutěž v Anglii). Své domácí zápasy odehrává na stadionu Selhurst Park s kapacitou 26 225 diváků. 1905/06 Southern Football League (Division Two) – 24 19 4 1 66 14 +52 42 1. 1906/07 Southern Football League (Division One) – 38 8 9 21 46 66 -20 25 19. 1907/08 Southern Football League (Division One) – 38 17 10 11 54 51 +3 44 4. 1908/09 Southern Football League (Division One) – 40 12 12 16 62 62 0 36 16. 1909/10 Southern Football League (Division One) – 42 20 6 16 69 50 +19 46 7. 1910/11 Southern Football League (Division One) – 38 17 13 8 55 48 +7 47 4. 1911/12 Southern Football League (Division One) – 38 15 10 13 70 46 +24 40 7. 1912/13 Southern Football League (Division One) – 38 17 11 10 55 36 +19 45 5. 1913/14 Southern Football League (Division One) – 38 17 16 5 60 32 +28 50 2. 1914/15 Southern Football League (Division One) – 38 13 8 17 47 61 -14 34 15. 1919/20 Southern Football League (Division One) – 42 22 12 8 69 43 +26 56 3. 1920/21 Third Division South 3 42 24 11 7 70 34 +36 59 1. 1921/22 Second Division 2 42 13 13 16 45 51 -6 39 14. 1922/23 Second Division 2 42 13 11 18 54 62 -8 37 16. 1923/24 Second Division 2 42 13 13 16 53 65 -12 39 15. 1924/25 Second Division 2 42 12 10 20 38 54 -16 34 21. 1925/26 Third Division South 3 42 19 3 20 75 79 -4 41 13. 1926/27 Third Division South 3 42 18 9 15 84 81 +3 45 6. 1927/28 Third Division South 3 42 18 12 12 79 72 +7 48 5. 1928/29 Third Division South 3 42 23 8 11 81 67 +14 54 2. 1929/30 Third Division South 3 42 17 12 13 81 74 +7 46 9. 1930/31 Third Division South 3 42 22 7 13 107 71 +36 51 2. 1931/32 Third Division South 3 42 20 11 11 74 63 +11 51 4. 1932/33 Third Division South 3 42 19 8 15 78 64 +14 46 5. 1933/34 Third Division South 3 42 16 9 17 71 67 +4 41 12. 1934/35 Third Division South 3 42 19 10 13 86 64 +22 48 5. 1935/36 Third Division South 3 42 22 5 15 96 74 +22 49 6. 1936/37 Third Division South 3 42 13 12 17 62 61 +1 38 14. 1937/38 Third Division South 3 42 18 12 12 67 47 +20 48 7. 1938/39 Third Division South 3 42 20 12 10 71 52 +19 52 2. 1946/47 Third Division South 3 42 13 11 18 49 62 -13 37 18. 1947/48 Third Division South 3 42 13 13 16 49 49 0 39 13. 1948/49 Third Division South 3 42 8 11 23 38 76 -38 27 22. 1949/50 Third Division South 3 42 15 14 13 55 54 +1 44 7. 1950/51 Third Division South 3 46 8 11 27 33 84 -51 27 24. 1951/52 Third Division South 3 46 15 9 22 61 80 -19 39 19. 1952/53 Third Division South 3 46 15 13 18 66 82 -16 43 13. 1953/54 Third Division South 3 46 14 12 20 60 86 -26 40 22. 1954/55 Third Division South 3 46 11 16 9 52 80 -28 38 20. 1955/56 Third Division South 3 46 12 10 24 54 83 -29 34 23. 1956/57 Third Division South 3 46 11 18 17 62 75 -13 40 20. 1957/58 Third Division South 3 46 15 13 18 70 72 -2 43 14. 1958/59 Fourth Division 4 46 20 12 14 90 71 +19 52 7. 1959/60 Fourth Division 4 46 19 12 15 84 64 +20 50 8. 1960/61 Fourth Division 4 46 29 6 11 110 69 +41 64 2. 1961/62 Third Division 3 46 14 14 18 83 80 +3 42 15. 1962/63 Third Division 3 46 17 13 16 68 58 +10 47 11. 1963/64 Third Division 3 46 23 14 9 73 51 +22 60 2. 1964/65 Second Division 2 42 16 13 13 55 51 +4 45 7. 1965/66 Second Division 2 42 14 13 15 47 52 -5 41 11. 1966/67 Second Division 2 42 19 10 13 61 55 +6 48 7. 1967/68 Second Division 2 42 14 11 17 56 56 0 39 11. 1968/69 Second Division 2 42 22 12 8 70 47 +23 56 2. 1969/70 First Division 1 42 6 15 21 34 68 -34 27 20. 1970/71 First Division 1 42 12 11 19 39 57 -18 35 18. 1971/72 First Division 1 42 8 13 21 39 65 -26 29 20. 1972/73 First Division 1 42 9 12 21 41 58 -17 30 21. 1973/74 Second Division 2 42 11 12 19 43 56 -13 34 20. 1974/75 Third Division 3 46 18 15 13 66 57 +9 51 5. 1975/76 Third Division 3 46 18 17 11 61 46 +15 53 5. 1976/77 Third Division 3 46 23 13 10 68 40 +28 59 3. 1977/78 Second Division 2 42 13 15 14 50 47 +3 41 9. 1978/79 Second Division 2 42 19 19 4 51 24 +27 57 1. 1979/80 First Division 1 42 12 16 14 41 50 -9 40 13. 1980/81 First Division 1 42 6 7 29 47 83 -36 19 22. 1981/82 Second Division 2 42 13 9 20 34 45 -11 48 15. 1982/83 Second Division 2 42 12 12 18 43 52 -9 48 15. 1983/84 Second Division 2 42 12 11 19 42 52 -10 47 18. 1984/85 Second Division 2 42 12 12 18 46 65 -19 48 15. 1985/86 Second Division 2 42 19 9 14 57 52 +5 66 5. 1986/87 Second Division 2 42 19 5 18 51 53 -2 62 6. 1987/88 Second Division 2 44 22 9 13 86 59 +27 75 6. 1988/89 Second Division 2 46 23 12 11 71 49 +22 81 3. 1989/90 First Division 1 38 13 9 16 42 66 -24 48 15. 1990/91 First Division 1 38 20 9 9 50 41 +9 69 3. 1991/92 First Division 1 42 14 15 13 53 61 -8 57 10. 1992/93 Premier League 1 42 11 16 15 48 61 -13 49 20. 1993/94 First Division 2 46 27 9 10 73 46 +27 90 1. 1994/95 Premier League 1 42 11 12 19 34 49 -15 45 19. 1995/96 First Division 2 46 20 15 11 67 48 +19 75 3. 1996/97 First Division 2 46 19 14 13 78 48 +30 71 6. 1997/98 Premier League 1 38 8 9 21 37 71 -34 33 20. 1998/99 First Division 2 46 14 16 16 58 71 -13 58 14. 1999/00 First Division 2 46 13 15 18 57 67 -10 54 15. 2000/01 First Division 2 46 12 13 21 57 70 -13 49 20. 2001/02 First Division 2 46 20 6 20 70 62 +8 66 10. 2002/03 First Division 2 46 14 17 15 59 52 +7 59 14. 2003/04 First Division 2 46 21 10 15 72 61 +11 73 6. 2004/05 Premier League 1 38 7 12 19 41 62 -21 33 18. 2005/06 The Championship 2 46 21 12 13 67 48 +19 75 6. 2006/07 The Championship 2 46 18 11 17 59 51 +8 65 12. 2007/08 The Championship 2 46 18 17 11 58 42 +16 71 5. 2008/09 The Championship 2 46 15 12 19 52 55 -3 56 15. 2009/10 The Championship 2 46 14 17 15 50 53 -3 49 21. 2010/11 The Championship 2 46 12 12 22 44 69 -25 48 20. 2011/12 The Championship 2 46 13 17 16 46 51 -5 56 17. 2012/13 The Championship 2 46 19 15 12 73 62 +11 72 5. 2013/14 Premier League 1 38 13 6 19 33 48 -15 45 11. 2014/15 Premier League 1 38 13 9 16 47 51 -4 48 10. 2015/16 Premier League 1 38 11 9 18 39 51 -12 42 15. 2016/17 Premier League 1 38 12 5 21 50 63 -13 41 14. 2017/18 Premier League 1 38 11 11 16 45 55 -10 44 11. 1919/20: Klub se stal po sezóně členem Football League, respektive její nově založené Third Division. 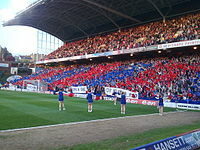 2008/09: V sezóně 2008/09 byl klubu odebrán jeden bod za neoprávněný start hráče v zápase s Sheffield United FC. 2009/10: V sezóně 2009/10 bylo klubu odebráno deset bodů kvůli špatné administrativě. Stránka byla naposledy editována 6. 11. 2018 v 15:00.